A couple weeks ago, I hit the wall with low carb baking. I was just so tired of my low carb flour options. You can use almond, coconut, flax, and soy. Maybe a little high fiber oat bran or rye. But each one poses its own challenge. You can make delicious things with them, but you can’t beat the ease of using good old fashioned multi-purpose flour. A few weeks back, I used the flour to make a psyllium husk bread. Since then I’ve used it as breading for chicken and fish. Delicious. And today, I used it to bake a multigrain yeast bread. And it is glorious. It tastes just like the real thing, because it uses whole grain flour like real bread. Only with 1/3 the carbs. Nice. So now I have a new flour for my low carb tool kit. 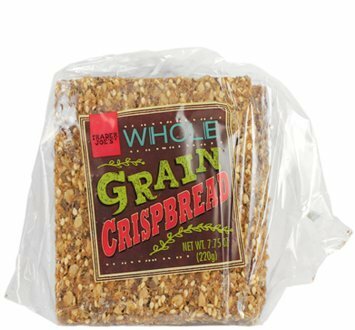 This is a recipe for mock multigrain bread that uses Trader Joe’s Whole Grain Crispbreads as it’s base. 1. Sprinkle the yeast over very warm water (not boiling or hot), then sprinkle the sugar over the yeast. Resist the urge to stir. Cover, and wait ten minutes for the yeast to rise and become frothy/bubbly over the water and sugar. It will become frothy. 2. Grind 8 Trader Joe’s Whole Grain Crispbread crackers in a blender until they make a course flour. 3. 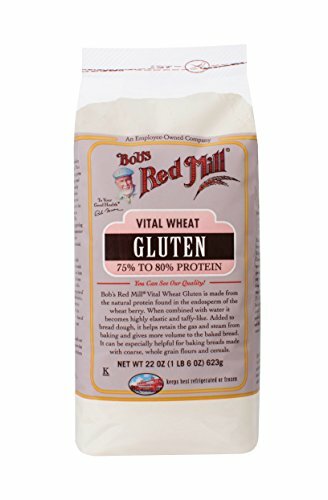 Blend vital wheat gluten and the cracker flour in a medium bowl. 4. Mix 1 1/2 cups of the flour mixture into the yeast mixture. 5. Stir for 1 minute. 7. Mix the baking powder into the flour mixture. 8. Stir the vinegar into the olive oil. 9. Stir the oil mixture into the dough until the liquid is absorbed. 10. Slowly mix in the remaining flour mixture. Towards the end, set aside the spoon and mix in by hand. 11. Cover the dough and let it rest for 10 minutes. 12. Sprinkle a work surface with vital wheat gluten. Add the dough to the prepared surface and knead for 10 minutes until elastic and smooth. 13. Grease a large bowl with butter or shortening. 14. Form the dough into a ball and add it to the greased bowl. Flip it so that it is buttered on both sides. 15. Cover with a towel and let rise until it has doubled in size (1-2 hours). You’ll know it’s ready when you touch the dough and the fingerprints remain. 16. Punch down with a balled hand, shape into a loaf and place in a greased loaf pan. 17. Let rise for 40 minutes, until it has almost doubled in bulk again. 19. Bake for 40 minutes, or until an instant read thermometer stuck in the middle of the loaf registers 190F. When you tap the bottom you should hear a hollow sound. 20. Allow to cool in the pan for 2 minutes. 21. Slide the loaf out onto a wire drying rack and cool completely. This bread was really good. I would never have thought of grinding up the Trader Joe crackers. Good idea. Thanks so much, I’m so glad you liked it. I love your blog. The bread recipe above. Is the nutrition info per slice or for whole bread? Yay! I’m so glad you like the site. The nutritional info is for one slice, and there are 12 slices total for the loaf. If that is too high, then you might want to try Psyllium Husk Bread which has about half the carbs. Here’s a link for that recipe.